I drifted away from the ICF b/c it seems to embrace coaching of a different sort and shy away from its intersection with Truth. Yea for YOU bringing the two together! (I attempted to find your video on FB to post a comment there, but wasn’t successful). Thanks for your deep thought and making this connection! I love your clarity and passion for integrating the ICF and the 3Ps. Molly, Your intense desire & passion to bring two of the things that feed your soul together for the benefit of an organization that will then touch many, many lives shines throughout your video. You Go! Hey Molly. 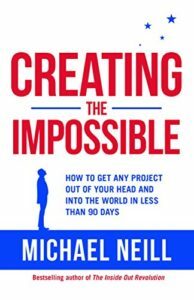 Is there a particular place to follow how your totally possible impossible project is moving forward? Will you provide a full report back at the end of the 90 days and what you learned and explored? Thank you for asking, Tivo. I will post videos and written reflections about progress here on my blog: http://www.shaboominc.com/blog including reflections and learning at the end of the 90 days, which is up April 21. It is likely that it will be a week or two after that before I digest and write up the results.